A poetic look at living in two different places: the Berkshires in Massachusetts and Charleston, South Carolina (October 2011, Planet Media Books, Stockbridge, MA). 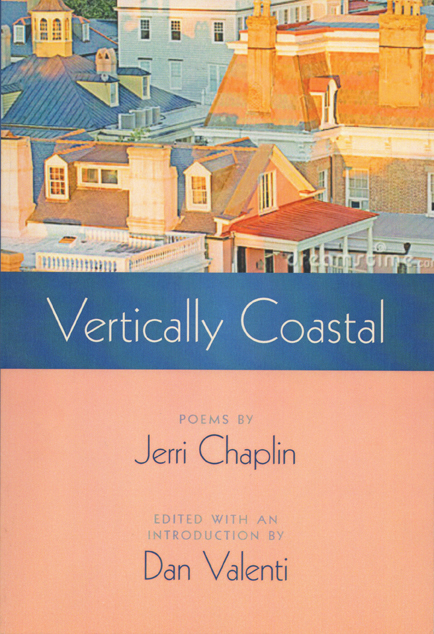 Vertically Coastal is available from the publisher for $19 ($17 plus $2 shipping and handling). Send your order to Dan Valenti, P.O. Box 1268, Stockbridge, MA 01262. Please include your name, address, and phone number. Checks or money orders payable to Dan Valenti. No credit cards. Using a credit card, you can also order from Amazon (put Jerri Chaplin or Vertically Coastal into the books search engine) for $19.99 ($16 plus $3.99 shipping) from Planet Media Books.